"Songs of Ascension" brings together many of the musical strands that have run though Meredith Monk's career. Voices are at the centre of everything, and the vocal writing is fresh and interesting throughout. Instruments are also involved, albeit in a more peripheral capacity. The work is "minimalist" in a number of senses, but most obviously through the fact that almost every movement is based on repeated figures. As ever, ECM provide an impressively illustrated liner, but more unusually, all of the images presented are actually relevant to the work on the disc. "Songs of Ascension" is a site-specific composition, it was written to be performed in the tower, designed by Ann Hamilton and built on the grounds of the Oliver Ranch in Geyserville, California. The tower is cylindrical with two intertwined spiral staircases lining its walls. 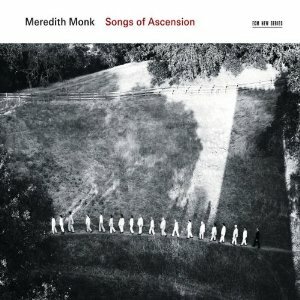 Clearly, the idea of ascension, with all the transcendental implications that carries, is central to the concept of the tower, and so too to the music that Monk writes to fill it. In the most literal sense, ascending themes often appear in the music, most notably in the climax at the end of the piece. But there is often a more abstract feeling of floating or of physical ascent suggested by the disembodied voices and ethereal instrumental textures. The best music by far is in the vocal parts. In the second movement, called "strand (gathering)", Monk seems to mimic the unison vocal textures with complex interrelated phonetics of Stockhausen's "Stimmung". The later vocal movements move between Cathy Berbarian style extended vocal techniques from a small group of singers and legato movements with a large choir. Two of the movements, one for string quartet and one for choir, are called "clusters", but it is difficult to tell why, as in both cases the harmonic language is simpler and more euphonious than the term implies. The use of instruments in the piece is of variable quality and interest. Monk includes one or two very exotic instruments, such as a khaen (a kind of bamboo mouth organ from southeast Asia) and a number of shruti boxes, an accordion type instrument from India used to play single note pedals. When these sounds appear under the vocal textures that add some interest and often seem to inform the vocal innovations by suggesting timbres for the voices to imitate. A string quartet is also used in some of the movements, but Monk's writing for this more conventional ensemble is less successful. She writes in a kind of John Adams type anodyne minimalist style, with two of three note figures endlessly repeated over very boring major chords. I also struggle with Monk's own vocal contribution, particularly in the penultimate movement, in which she performs for almost five minutes, producing strange and, for the most part, unpleasant vocal sounds over the drone of a shruti box. It's fine if you like that sort of thing, I suppose, but if you are not a dedicated fan, patience very quickly wears thin. Of course, Meredith Monk has a considerable fanbase of listeners who are likely to forgive her these various indulgences. They should find this new recording very worthwhile, especially given the quality of the performance and the recording. Sadly, it was not recorded in Ann Hamilton's tower but instead at the Academy of Arts and Letters in New York. The sound is richly resonant, but presumably with a different resonance from that of the tower. It is a classic ECM resonance though, that warm, rich sound that is one of the company's trademarks. In fact it is an ECM classic all round - it's just you might have to be a committed fan of Meredith Monk to enjoy everything you find here.